Commonly called “traditional braces,” metal braces are individual stainless steel brackets that are bonded, or glued, to the teeth that allow for a series of wires to be tied to them in order to apply pressure to the teeth and ultimately move them. Metal brackets are the most common type of braces for children and teenagers because they are the most durable type of bracket and they allow the patient to choose from a wide variety of colored ties to be used at the time of regular adjustments. Ceramic braces are a very popular alternative to metal braces. They are made from a ceramic material that matches the natural color of the teeth making them difficult to see once they are placed. While they are slightly more expensive than traditional braces, they are far less noticeable and very esthetic. Unlike the metal braces, the clear brackets are more likely to pick up staining if the patients are not diligent in their daily oral hygiene or if they have certain colored foods or drinks. The ceramic braces often have the same level of discomfort and soreness as traditional metal braces. Invisalign® is a series of clear plastic trays, or aligners, that snap onto your teeth and apply gentle forces to slowly move them into their new position. They are typically changed every 1-2 weeks depending on the amount of movement needed. The use of tooth colored composite attachments create small bumps that are bonded to certain teeth by the doctor to help the aligners fit securely and aid in the proper movement of the teeth. Aligners should be removed to brush and floss in order to maintain good oral hygiene. Invisalign® treatment will work only if the aligners are worn 22 hours a day, which means they should only be removed when eating and brushing and then promptly placed back onto the teeth. Wearing elastics, or rubber bands, from the top braces to the bottom braces are what help correct the bite and improve the overall fit of your upper and lower teeth. Wearing rubber bands as instructed is the most effective way for patients to advance their treatment and even reduce the time that they are in braces. Remember that the rubber bands only work when they are worn exactly as prescribed by the doctor. The Carriere® Motion™ Appliance is used for Class II patients, to correct the molar alignment and excess overbite and overjet at the beginning of the treatment before braces or aligners are placed. The simplicity and ease-of-use of the Carriere Motion adds up to more predictable results and overall shorter orthodontic treatment time. Patients who wear their rubber bands properly with the Carriere Motion will have less time in braces making this appliance a real game changer! small space to sometimes develop between the top front teeth. This space can be especially helpful when there is a lot of crowding present and it will be closed after the braces are put on. The Herbst® appliance is a fixed functional appliance that treats excessively large overbites caused by an under developed lower jaw by holding the lower jaw in a more forward positon as the jaw is growing. The Herbst also places pressure on the upper molars moving them backward into the proper position. This fixed appliance is most effectively used in growing adolescent patients at, or near, the patient’s growth spurt. The design of the Herbst allows the patient to make all the normal movements with their jaw while eating, chewing, talking, and singing. It can be used with or without upper braces and is normally worn for about 12-15 months. Reverse pull headgear is a removable appliance used to treat patients with a small, under developed upper jaw that has not grown forward enough to create a normal overbite. These patients will sometimes have a concave profile with flat cheek bones and almost always have an underbite. 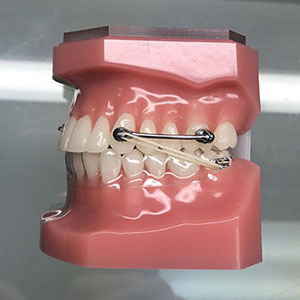 The reverse pull headgear will help guide and increase the growth of the upper jaw forward and correct the skeletal imbalance in order to help correct the bite. The reverse pull headgear is used in younger patients that are still growing and is typically most effective when used between the ages of 7-10 years old. It is typically used with upper braces and is worn 8-10 hours a day while sleeping for up to 9-12 months. Retainers are an extremely important part of orthodontic treatment. They may be removable or fixed. They hold the teeth in their newly aligned positions after having been straightened with braces or aligners. Retainers come in different styles such as the traditional Hawley retainer that is made of acrylic and metal wires, or the clear plastic retainer that is much less noticeable. It is important to care for your retainer properly to ensure that it always has an ideal fit. Your orthodontist will instruct you on how to care for your retainer and about the duration of the wear. Wearing your retainer as directed is crucial to prevent shifting of the teeth and the potential need for having braces again. Patients who have had orthodontic treatment should make a personal commitment to wearing retainers when sleeping night time for life time. Separators are little rubber doughnuts, or rings, that are be placed between the back teeth to help push them apart creating a small space so that orthodontic bands or appliances may be placed on the molar teeth during the next appointment. The separators will be removed before the bands are glued to the teeth. Separators should not be removed by the patient so it’s important to remember that they do not mix well with sticky candy, chewing gum, toothpicks, or dental floss. They can be brushed with a toothbrush like normal.